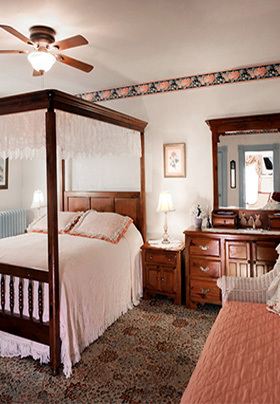 Perfect for a romantic getaway in Cape May, New Jersey, our Lucia Suite (#3) is a charming one-bedroom suite located on the second floor overlooking Washington Street. While the suite offers romance, it is also ideal for a family vacation, with extra sleeping options for up to 6 guests. The highlight of this suite is the queen-size, lace-canopy bed with lace from London. The Lucia Suite is tastefully appointed with a mix of antique and contemporary furniture, handmade curtains, drapes, and Victorian lampshades. A combination living room and dining area with one queen-size sofa bed, flat-screen TV, VCR/DVD, antique oak dining room set with handmade Victorian lampshades, and walnut gas-log fireplace with remote control. Private fully equipped kitchen with gas stove, microwave, toaster oven, coffee pot, refrigerator, and kitchen sink. Master bedroom with a queen-size canopy bed decorated with handmade lace from London, wicker twin-size daybed with twin trundle below, TV/DVD/VHS, and charming bay window overlooking downtown. 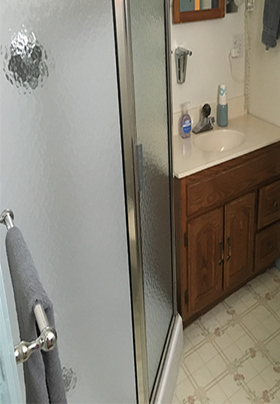 Private bathroom with modern corner shower, sink, and toilet accessible from both the living room and bedroom. Single-room air conditioners in both the bedroom and living room. Entrance to suite is from front of house with door accessible from both living room and bedroom. Antoinette’s Apartments &amp; Suites is the best place in Cape May. It has different sized apartments to serve the needs of a couple or large family. Easy walking distance to the beach, the Washington St. Mall and restaurants. Since all apartments have kitchens, you have numerous food choices to eat in or go out. Whatever you need, Deanna makes available. There are bicycles, a porch with rocking chairs and awning, and table and chairs along the side if you care to eat outside. The atmosphere is rejuvenating!